The driveway and garden of your new home will be the finishing touch to all your hard work. By leaving the front garden of your self-build home looking like a building site you will attract opportunist thieves who think the home is empty. Apart from this the neighbours could be unhappy about you making the street look untidy. Make the plans for the drive and garden in with the over all costing when you first design the house. This part of the build can be costly – especially if you have a large plot. Hire a skip and remove all scraps of building materials, rubble and rubbish. This rubbish will be attractive to children who could be injured while playing. Fit gates and ensure that fencing put up at the beginning of the build is still secure. It may be that there is no spare money at the end of the build and you need will an inexpensive way to tidy up the site. Once old building materials are cleared away. Flatten out the drive and pathway areas. Laying shingle is a simple process and most builders’ merchants will deliver this product. It looks instantly tidy and pleasing to the eye. Shingle is also very good for security as any approaching footsteps can be heard. Raking the shingle every so often will keep it in place and looking good.Turf can be laid and will instantly cover the rest of the garden. If the soil beneath is not very good have some topsoil put down before the turf, this is available from garden centres. Unsure of how to plan your garden? Most garden centres will advise you on this process, they will most probably have a garden design service as well. Watch gardening programmes on the television, books and magazines accompanying the series usually have plans that are easily followed. It may not be an option to leave the landscaping of your plot to be done at a later date. Quite often planning consent includes a clause whereby you have a time limit in which to finish of this aspect of the self-build. There are some very attractive paving products on the market. 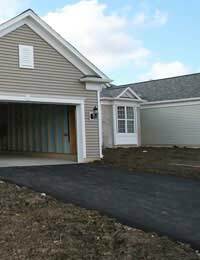 You have built your own home so why not lay the driveway yourself as well? The larger do-it-yourself centres have leaflets explain how to level the ground and prepare it before laying the paving. If you are unsure of doing it yourself take a look at other homes that have had this done to the front of the home. If the work looks good, is not uneven and is wearing well ask for the name of the contractor who carried out the work, the job will be finished in days and ready to use. Have you seen the driveways that look as though they are paved but are in fact concrete with a colour added and then imprinted with a paving effect? It’s quicker and cheaper that the proper paving but beware, this can crack and lose its colour. Some people lay far too much of this product and the front of the home ends up resembling a supermarket car park. Consider if you will need a built in barbecue area or will rely on portable equipment. Is the shed large enough to take the barbecue along with all the gardening implements now needed for the newly landscapes garden. Before the landscape is started check that you are happy with security lighting and water taps. Are they in the right places or will they need moving which could spoil the work already done. Where is the sun in relationship to your garden? You may want to lay patio area or sight a washing line. Laying a dozen or so large paving slabs gives an automatic and temporary patio area that can be moved if at a later date you find it is wrongly sited. Ensure all manhole covers are fitted and soak-away dug before putting down paying or planting the garden. Your garden will be a part of the home that will be enjoyed for years to come, plan it well and it will be worth the added work.